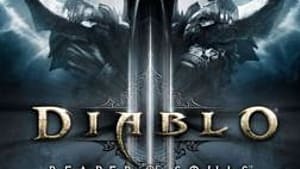 The Rise of the Necromancer expansion adds a lot of new features to Diablo 3, but the coolest and most obvious one is the Necromancer itself. This class is bad to the bone -- and nothing feels more rewarding than mowing down mobs of enemies with exploding corpses and hordes of skeletons. This guide is split into two sections: a necromancer power leveling guide and a set of suggested necromancer leveling builds if you're playing seasonal or want to start from scratch. 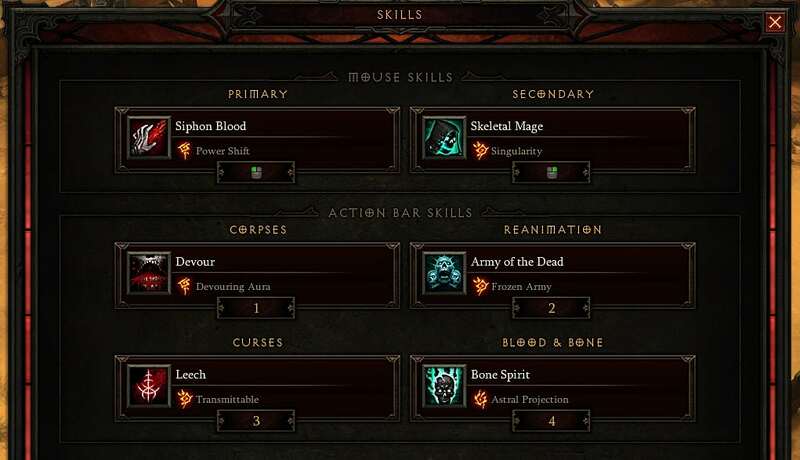 This early game necromancer leveling build is my favorite on the list because of the insane damage you can do with it at low levels. 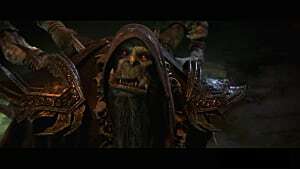 There's nothing like seeing an elite mob that gives you the run-around on another character go down in seconds flat from a few bone lances to the face with the Necromancer. This build is based around using bone spikes and bone spear as your main filler spells, while you wait for command golem to come off cooldown for corpses so you can bone lance your enemies to death. Bone Spikes with Sudden Impact: This is the skill you use to build essence for this Necromancer leveling build. Amazing range and an AoE stun make this a perfect skill for kiting enemies while keeping them grouped together. Bone Spear with Blighted Marrow: Use this skill when you have essence. It, too, has amazing range -- and this rune causes the spears to get stronger with each consecutive enemy it hits so use it in tandem with bone spikes to line stunned enemies up for tons of damage. Corpse Lance with Brittle Touch: Use this when you have corpses. This is going to be your biggest single-target damage dealer for this build. It is great for shredding low level bosses and gets a significant damage boost from the rune's critical chance increase. Command Golem with Flesh Golem: Use this on cooldown. Stand behind your new buddy and let it take the damage as you safely corpse lance enemies from afar with the extra corpses generated by the flesh golem rune. Decrepify with Dizzying Curse: Use this on all enemies. This skill is the most flexible of the bunch for this Necromancer leveling build, and you can substitute it with either leech or frailty -- but a slow with a chance of stun is the safest option for kiting mobs in larger areas. Bone Armor with Vengeful Armaments: Try to use this in groups and keep it refreshed. Vengeful armaments increases the damage this skill does and is especially effective in large groups of mobs. Fueled by Death (Passive): The constant barrage of corpse lances you'll be doing means you'll always have stacks of this passive to make sure you can keep a safe distance from enemies. 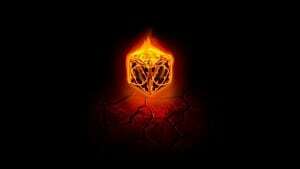 Stand Alone (Passive): Your only pet will be the golem with this Necromancer leveling build, so you can gain a pretty significant amount of survivability from this rune. Commander of the Risen Dead (Passive): Command golem's cooldown being reduced by 30% means more corpses and more corpse lances. 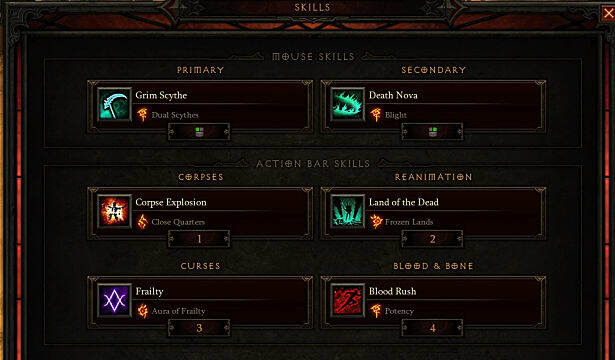 This is a fantastic mid-level Necromancer leveling build. Your skeletal mage will burn down enemies to provide you with corpses to devour so you can reduce your bone spirit cooldown and spam it on your main target. Siphon Blood ensures that you stay alive long enough to do it and have a steady stream of damage when your main damage skill is on cooldown. Siphon Blood with Power Shift: Use this to build up your essence. Try to keep this skill going as often and as long as you can to maintain the stacks provided by the runes for increased damage. You can easily shred through enemies with full stacks of siphon blood while regaining health using this necromancer leveling build. Skeletal Mage with Singularity: Use this when your essence is full. This rune makes it so that you have one super powerful skeletal mage that, with the passive skills you'll take, lasts for a long time as you send bone spirits at your enemies while siphoning their blood. Devour with Devouring Aura: Try to stay near corpses to make the most of this aura. Taking this rune makes it so you can more quickly devour corpses to lower bone spirit's cooldown. Not only that, but it will restore your essence so you can summon more powerful skeletal. 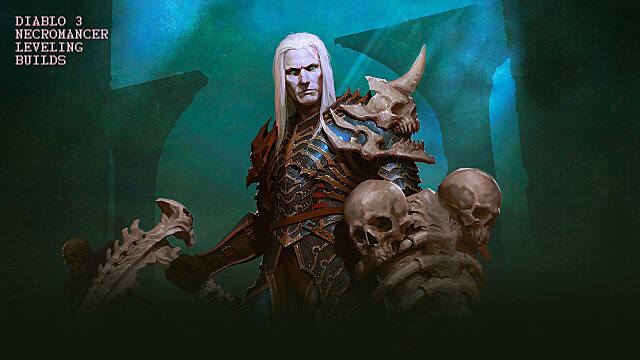 Army of the Dead with Frozen Army OR Command Skeletons with Enforcer: Use Army of the Dead on cooldown and use Command Skeletons sparingly with this Necromancer leveling build. 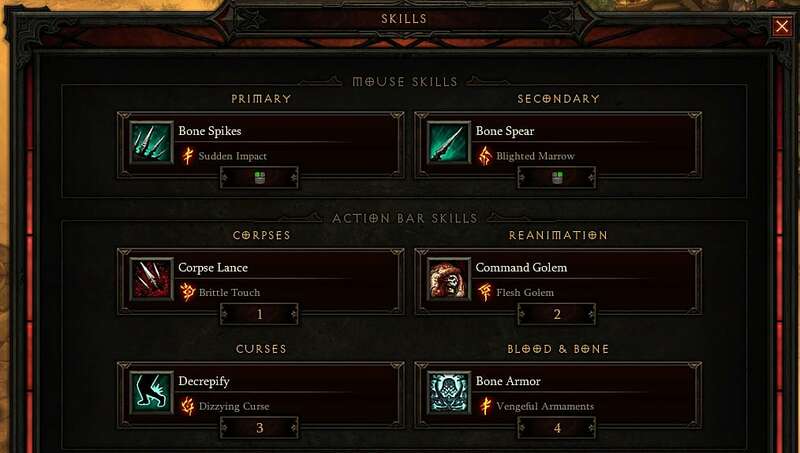 Army of the Dead makes the most sense in synergizing with this build as it does not have as much of an essence requirement that would eat into the essence needed for skeletal mages, but Command Skeletons can have its essence usage mitigated by the enforcer rune, and it will provide more survivability than Army of the Dead. Leech with Transmittable OR Frailty with Scent of Blood: Use this when you first engage a group of enemies. Like the skill above and the curse slot for the previous build, this one's flexible -- but I found that Leech provided the most sustainability for the 30-50 range. Frailty will give you more damage if you find yourself having no problem staying alive. Bone Spirit with Astral Projection: Use on cooldown. This is the big damage dealer skill in this Necromancer leveling build. It is perfect for using in large groups of enemies, as the more of them the spirit passes through, the more damage it ends up dealing to its target. Try to hit as many extra enemies as possible for more damage! Fueled by Death: You can't die if your enemies can't catch you! Overwhelming Essence: More maximum essence means more essence for skeletal mage damage. Extended Servitude: More skeletal mage time means more skeletal mage damage. This is another fantastic mid-level Necromancer leveling build, but it is intended for group play and has less survivability than the previous two builds. To take full advantage of this build, you must have a tank or someone else who can help keep you alive. You will want to gather enemies in front of you using Grim Scythe, blast them with damage and poison from Death Nova, use Frailty to build up close corpses, use Corpse Explosion to explode them, and use Land of the Dead to explode them even more. Grim Scythe with Dual Scythe: Use this to build your essence. You will want to try and gather as many mobs together with the Dual Scythe rune to build up essence as quickly as possible to use death nova as much as possible with this necromancer leveling build. Death Nova with Blight: Use this when you have essence. This skill is amazing. You can deal tons of AoE damage while slowing and weakening your enemies thanks to this rune! Your group will thank you for taking this. Corpse Explosion with Close Quarters: Use this when you have corpses. Although you don't have as much control over where you can explode your corpses, you can deal more damage to the enemies that will likely already be in Grim Scythe range. Land of the Dead with Frozen Lands: Use this on cooldown. It grants an unlimited amount of exploding corpses with the chance of freezing enemies caught in the messy blasts. Frailty with Aura of Frailty: This is a passive aura. 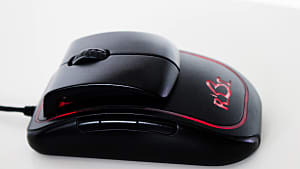 It will make sure that enemies who get close to you have a chance of dying, giving you more survivability. But it also ensures that your corpses stay nearby to synergize with corpse explosion. Blood Rush with Potency: Use this when necessary. Since this is a Necromancer leveling build based around getting up close and personal, you will need an "oh crap" button -- and this is it with bonus armor. It's perfect for moments when you get caught in the middle of a group of powerful enemies. Stand Alone: You have no pets in this build, so get some extra armor. Rigor Mortis: This synergizes extremely well with Death Nova to debuff your enemies as much as possible. Spreading Malediction: Goes well with your Frailty aura to give you a nice damage boost. This necromancer power leveling guide (brought to us by YouTube user Anon Ymous) is only usable if you've played a ton of the game already and have the right gear. If you don't have the right gear, follow the power leveling builds above to ensure that you're specced properly. 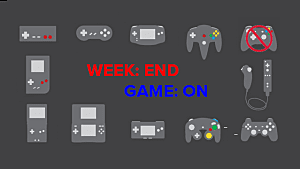 If you do have the right gear, then you better start planning your end-game build now -- because you'll hit 70 in no time. In order to use advanced gear at a lower level, you will need to have access to Kanai's Cube and several rank 25+ Gems of Ease. Check out our noob's guide to Kanai's Cube for more information. Once you have the right gear equipped, turn the difficulty up to the highest that you can reasonably handle then go out and grind until you hit cap. The creator of the video went out into the outskirts of New Tristram and hit level 17 off of his first kill! If you don't have the necessary gear and don't mind grouping up, you can still power level until your heart's content with power leveling communities. You might have to beg until you find someone nice enough to power level you, but the community is surprisingly less toxic than many other online games. This necromancer power leveling guide and the leveling builds will get you started on the right path with your new favorite class. 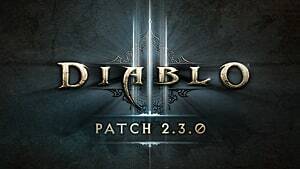 If you still need a little extra assistance with the game, check out the rest of our Diablo 3 guides. What's your favorite build so far? Favorite pet? Tell us in the comments, and stay tuned for more Rise of the Necromancer tips! 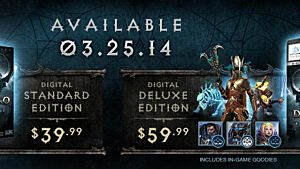 Diablo III: Reaper Of Souls Review; Should You Fear The Reaper? 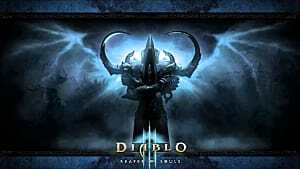 Diablo III: Reaper of Souls Beta Impressions!